Any ballplayer named Rhodes is bound to attract the nickname "Dusty," and that was true with John Gordon Rhodes as well. A right-handed pitcher who stood an even six feet tall and is listed at 187 pounds, he pitched in an even 200 major-league ballgames with a career record of 43-74 and an earned run average of 4.85. Only once did he have a winning record – 6-3 for the New York Yankees in 1931. His last year in the majors saw him a 20-game loser (9-20) for the Philadelphia Athletics. Rhodes's minor-league record also had fewer wins than losses, but only marginally – 47-48 in 173 games. New York Yankees scout Bill Essick happened to be present when the 17-year-old Rhodes pitched a no-hitter for West High School. That caught Essick's eye, of course, but the deal they struck was reportedly that Rhodes would complete four years at the University of Utah before reporting to the Yankees in 1930.2 He played baseball and track at Utah. But he didn't wait until 1930. Rhodes made the Yankees in spring training. He was unimpressive in his debut, though, on April 29, 1929 at Philadelphia. The Athletics already held a 5-1 lead when Rhodes took over; he pitched six innings but coughed up five in the eighth inning. Only one of the runs was earned, but it was Rhodes's own error that kept his ERA from taking a bigger hit. After loading the bases, a walk forced in one run, a bases-clearing triple by Mickey Cochrane drove in three more, and then Cochrane took advantage of the flustered rookie by stealing home while Rhodes was "blowing himself to an elaborate wind-up. "8 Two outings in May saw him touched for seven earned runs in 3 1/3 innings (and he even lost an exhibition game to the Pirates, 8-2.) He lost his one start, on May 7, to the Tigers. On May 28, the Yankees sent him to Jersey City, on option, to get more seasoning. He struggled there, 6-14 with a 4.82 ERA, but was brought back to New York at the start of September, appearing in seven games with uneven results. In second place, but well out of the running for the pennant, the Yankees wanted to get another look at a number of their young players to get a better sense of what they had. Rhodes lost each of his three September starts. The Yankees kept him with the team in April 1930 and he pitched two innings in three relief outings, giving up two runs in the third one. He was 1-3 for Jersey City in eight games, but most of the year he played for Hollywood again (9-2, but with a 5.23 ERA, in 117 innings.) His innings total was hurt by a lame arm later in the season. Rhodes began 1931 in the minors with the Newark Bears, appearing in 17 games. His won/loss record was 6-3 with a 3.53 ERA. He was brought back to the big leagues in mid-July and pitched in 18 games (11 starts) through the end of the season. He finished strong, with a complete game win in each of his four final starts and a total of eight earned runs over the four games. His record for the Yankees was the same 6-3 as he'd achieved for Newark. Rhodes had planned to get married in March, before the season began, but agreed to defer the wedding until after the season.9 He wed Leah Marjorie Riser on October 24, a "sorority girl" he knew from university. Having finished so well in September, Rhodes had every chance to break into the Yankees rotation in 1932. He won his first start, 6-3, another complete game, over the Red Sox in Boston. He only lasted a third of an inning in his second start, however, facing eight batters and seeing five of them score. The Yankees won the game, beating the Athletics 16-5 and taking Rhodes off the hook. His next eight appearances were all in relief. By the end of July he was 1-2 with a 7.88 ERA. On August 1, the Red Sox and Yankees in effect swapped pitchers, both of them passing through waivers unclaimed. Sox manager Marty McManus saw little future with Wilcy Moore, age 35, and was willing to take a chance on Rhodes, still just 24. The Yankees wanted a reliever for the rest of the season and thought Moore would suit them fine.10 He did; though he only appeared in 10 games, he was 2-0 with a 2.52 ERA. Rhodes was 1-8 for the 43-111 last-place Red Sox. His ERA was a mediocre at best - 5.11. The Sox stuck with him, however, for 1933 and 1934 and he won an even dozen games in each year. 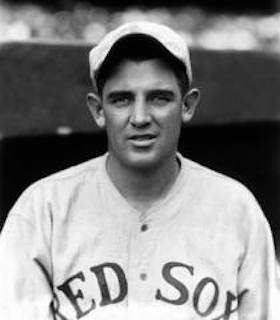 Given his age, Rhodes was still considered a prospect when the 1933 season began. In Cleveland, the Plain Dealer assessed him: "plenty of stuff, but with a tendency toward wildness…another prospect of whom much is expected. "11 In fact, Rhodes was the "ace" of the Red Sox staff; he was 12-15 with a 4.03 ERA, but his 12 wins were three more than anyone else on the seventh-place team. The team ERA was 4.35. He could well have had a better record if he'd had better offensive support. Rhodes lost his first four decisions by scores of 2-1, 2-1, 3-2, and 2-1. Eight of his 15 losses were by just one run. He did hit occasionally, and had a particularly good game on August 25, when he hit a home run and two singles with three RBIs in an 8-1 win over the White Sox. He hit .194 over the course of his 356 big-league at-bats. He wasn't the most adept fielder, with a career .933 fielding percentage. In 1934, Rhodes got off to a much better start, 5-1 in the first month. By season's end, he was 12-12 (4.56). Both Johnny Welch (13-15, 4.49) and Wes Ferrell (14-5, 3.63) had more wins and better earned run averages. Rhodes only won two games in all of 1935, a 12-2 win in Chicago on May 10 and a 6-5 win against the visiting Philadelphia Athletics on September 24. He lost 10 games and recorded a 5.41 ERA. After the season, the Red Sox traded him to the Athletics for Jimmie Foxx, though admittedly there was a little more to the story than that. The Sox also sent $150,000 of Tom Yawkey's money to a financially-strapped Connie Mack. Johnny Marcum came to Boston, too, and minor-leaguer George Savino went to Philadelphia. The trade was consummated on December 10. Mack was hopeful that Rhodes would bolster his mound staff. The new Athletic right-hander lost his first start, to Boston, 2-1 , then won his next two. He had a 2.00 ERA after three starts in April. Come season's end, though, that ERA had jumped to 5.74 (he gave up 26 homers, more than anyone in the league), and he finished 9-20, leading the league in losses. On October 9 the Athletics sold, outright, both second-baseman Al Niemiec and Rhodes to the International League's Baltimore Orioles. Rhodes played three more seasons of professional ball – 1937 for Baltimore, 1938 starting with San Diego in the PCL but (released on May 31) ending with Dallas (signing with them in early July), and then appearing in just four games for Dallas in 1939 before his April 30 release. He was 5-9 with a 6.24 ERA for Baltimore, not an impressive achievement. He was 3-7 for Dallas in 1938, with no decisions for Dallas in 1939. At the time of the 1940 census, Rhodes was living with his mother and brother in Salt Lake City, while working as an automobile salesman. He had divorced in 1939, and married again in 1940 to a woman named Thelma. After the war, he married a third time to a woman named Melba. During the war, Rhodes enlisted in the United States Army, joining Company A of the 324th Infantry. He served from September 15, 1943 to his honorable discharge on September 9, 1945. Corporal Rhodes saw combat and earned a Bronze Star. He had two daughters, Patricia and Suzanne, though we are not sure whether their mother(s) was/were Leah, Thelma, or Melba. Gordon Rhodes died of cancer on March 22, 1960, in the Veterans Administration Hospital in Bellflower, Los Angeles. He was divorced again by the time of his passing. The State of California death certificate says Rhodes was working as a kitchen helper, apparently for the Ford Motor Company.12 He is buried in Sawtelle National Cemetery (Los Angeles National Cemetery). In addition to the sources noted in this biography, the author also accessed Rhodes’s player file and player questionnaire from the National Baseball Hall of Fame, the Encyclopedia of Minor League Baseball, Retrosheet.org, Baseball-Reference.com, and the SABR Minor Leagues Database, accessed online at Baseball-Reference.com. 1 Boston Herald, August 2, 1932: 17. 2 San Diego Evening Tribune, August 30, 1927: 26. See also Springfield (Massachusetts) Republican, January 28, 1934: 11. 3 Los Angeles Times, July 20, 1928: 11. 4 San Diego Union, July 21, 1928: 9. 5 San Francisco Chronicle, August 17, 1928: 28. 6 New York Times, January 11, 1928: 33. 7 San Francisco Chronicle, August 17, 1928: 28. 8 New York Times, April 20, 1929: 36. 9 Boston Herald, August 6, 1931: 26. 10 Boston Herald, August 2, 1932: 17. 11 Cleveland Plain Dealer, February 8, 1933: 18. 12 Daughter Patricia completed his player questionnaire for the Hall of Fame and said Ford was his employer at the time of his death. The California death certificate said he was employed as a kitchen helper.